Dollar - The World's Reserve Currency | Business Article | MBA Skool-Study.Learn.Share. Roman Empire reigned for more than 1,000 years. They conceived the British as a lowly state. Then British Empire ruled the world and had similar outlook towards America. Big Empires assumed that they were indispensable but there comes a time when some other state takes over the reins and rides over the tides. A lot of people are expecting a similar transition happening sooner or later in today’s world. British Pound was the 1st currency held in foreign reserves during the 18th& 19th century. But after the World War – II, since U.S. was an Economic Powerhouse and USD was backed by Gold, therefore, it became the foreign reserve’s currency. In 1975, OPEC started accepting only USD for the payment of oil. Similarly other commodities also came to be priced in USD. 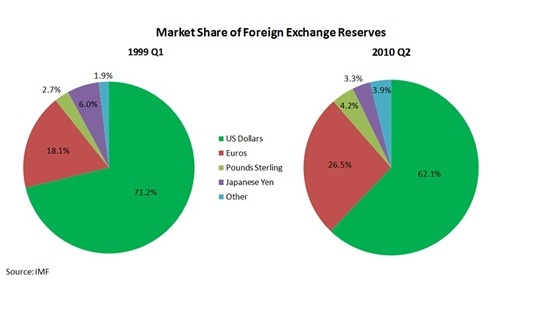 Today, more than 60% foreign currency reserves in the world are in USD. 85% foreign exchange transactions are trades of USD with other currencies. Half the international debt securities are denomination in USD. U.S. can print Dollar’s without thinking about inflation. They can import more than they export, consume more than they produce and spend more than they earn. For the 1st time in 50 years there are real rivals for USD. China& Japan are abandoning the USD in bilateral trade. Currency Agreement is already in place between Russia & China. China, biggest trading partner of Africa, is aggressively expanding the use of Yuan. USD is in danger of losing its safe-haven status due to its total federal debt reaching 100% of GDP. BRICS are planning to use their own currencies to trade with each other. China & UAE have agreed to replace USD with their own currencies in oil transactions. India & Iran are planning to use gold to trade oil. China & Iran have created a barter system to trade oil. What if the authority of USD comes to an end? Widespread variations in American lifestyle through massive inflation & high interest rates. Increase in cost to US companies for converting foreign-currency earnings into USD. Purchasing forward contracts and options to hedge against fluctuating exchange rates. Low appetite for U.S. Treasury securities by foreign central banks will lead to inability of U.S. government to finance its budget deficits so cheaply. U.S. will be not able to run such large trade and current-account deficits. Narrowing the current-account deficit will require more exports i.e. devaluing USD in world markets. Increase in USD and a corresponding decline in other major currencies during financial volatility will be less. With USD, Euro and Yuan seen as safe havens, there will be movement in all 3 of them in periods of financial distress. It will be convenient & competitive for banks & companies dealing in trade with Europe & China if they will do international business in their own currencies. Euro is a currency without a country and without any sovereign backing. We have seen how the failure of a single state likes Greece, which is the 32nd largest economy in the world, can move the global equities markets into panic mode. The World cannot simply move to the Gold Standard because of its inadequate supply. The World cannot explore, discover, develop, and mine enough gold to keep up with current global economic growth. Value of Yuan is still managed by the state by keeping it artificially low. It’s not convertible or allowed to be traded without restrictions. Chinese exporters will suffer if the Yuan is left to trade freely, therefore, China doesn’t want Yuan to appreciate as of now. Fundamental alterations in the economic model of China will be required including an open capital-account, floating currency and financial-market liberalization which will not be an easy proposition because of tough political opposition and powerful vested interests. SDR can help in stabilizing the global financial system and creating SDR-denominated bondscan decrease the central banks' reliance on U.S. Treasuries. Oil & gold can also be valued using SDRs. It can help in checking the spikes in energy prices that often occur when the USD weakens significantly. However, value of SDR is closely tangled with some of the national currencies, so anything that will affect such currencies will affect SDRs as well. Bancor can be designed as a steady stockpile of value, not tangled exclusively with the situations of any particular economy or currency. But there is a problem which is very much similar to that of the USD. The USD has been devalued by the Federal Reserve by more than 95 % since its inception. Moreover, the U.S. governments have accumulated the largest debt in the history over a period of time. Looking back and considering how catastrophic the Federal Reserve System and other central banking systems around the world have been, why would anyone endorse a global central banking system fashioned on similar lines of institutions which have already done so much damage? World is moving towards bilateral agreements between countries and regions for bypassing the USD regime as of now and it will increase in the coming years especially with the waning of U.S. fundamentals. But the end of USD does not look like to be coming soon. However, there are good possibilities for such a thing to happen in future. If U.S. wants to maintain its dominance in the world markets then it will have to come up with solutions to its problems and keep a check on China, which in itself is a very herculean task. The recent European Crisis and the way U.S. handles it in the coming 2-3 years can go a long way in predicting supremacy of the USD in world trade and markets. At present no one, including Governments as well as financial institutions, should maintain their reserves in only USD denominated terms. They should diversify it in various currencies and GOLD which is the ultimate hedge against such fluctuations in world economy and currencies. This article has been authored by Rahul Gupta from SIBM Pune.